A modern constellation created inn 1776 by the French astronomer Pierre Charles Le Monnier. The constellation represents a type of bird that is also known as a solitaire. The constellation was never widely recognized and was replaced by other birds, including Noctua, the owl, and the Hermit Bird, which was created by the English astronomer John Flamsteed. 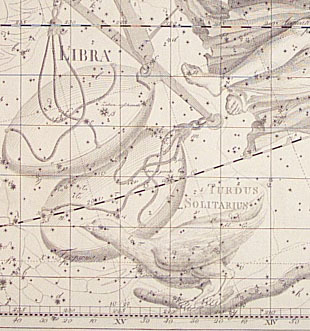 The constellation was located on the end of the tail of Hydra, the sea-serpent, just below Libra, the scales. Its is no longer recognized by astronomers and its stars have been incorporated back into Hydra and Libra.